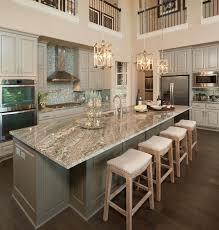 With breakfast bars and dining counters more popular than ever, bar stools have quickly become a kitchen essential. But before you scoop up a set, there’s a lot to consider, like do you want to swivel, stay stationary, or simply sit comfortably? 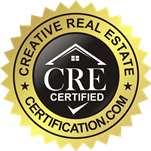 Below are the options so that you can choose the perfect ones for you. There’s nothing worse than a bar stool that’s too tall or too short; not only will it be uncomfortable…it will also look disproportionate. Here, we break down the three most common bar stool heights, and how to choose between them. Counter Stools: At 24-26” high, counter stools pair best with surfaces that are 36” off the ground. 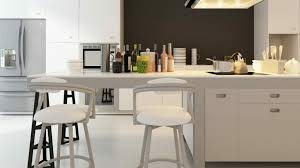 This is the standard height of kitchen counters and islands, so you should typically look to this type of bar stool for your dining area. Classic Bar Stools: Standard bars are around 42” high, so bar stools with a height of 30” are your best bet for a wet bar at home. And that’s actually the same size bar stool you’d see in restaurants and bars. Extra Tall Bar Stools: If your surface is unusually high go for an extra-tall style. These typically measure 34-36”. Extra-tall bar stools are also a great option for viewing parties, for instance, when a sports game is on the television. Bar stools come in an array of shapes and styles, so before making a decision, it’s important to consider both your comfort needs, and the aesthetic of your space. Here, the three most common styles you’ll find. 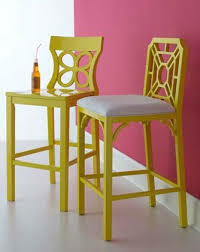 Backless: A simple backless bar stool is perhaps the most common design. Typically round, these stools are perfect if you’re looking to save space and prefer to keep stools hidden beneath your counter. Keep in mind, however, that backless stools might not always be the most comfortable option, and may keep your guests from sitting too long. Bar Stools with Arms: If comfort is your priority, bar stools with arms are best. They provide more support than a traditional backless stool, and are perfect for a sit-down meal at your bar or for watching television while you imbibe. However, they’re much wider than backless styles, meaning you might not be able to fit as many stools across as planned. Swivel Stools: Bar stools can be heavy, so choosing one with a swivel function prevents you or your guests from struggling to scoot back and forth from your counter. Though the swivel function is convenient, it may not be suitable for households with lots of young children. Upholstered Stools: If your kitchen counter is your main dining area, you may want to consider an upholstered style. Not only are they more comfortable than non-cushioned styles, they’ll add an air of formality to your counter-top dining. Like any other piece of furniture, when it comes to choosing your bar stools, material matters. Whether you’re looking to fit a particular style, or for a durable material that can stand up to heavy use, weight the pros and cons of the most common bar stool materials below. 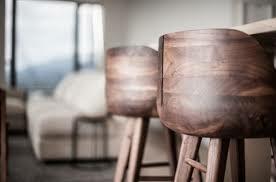 Wood: Wood bar stools are a solid option that can fit with nearly any style aesthetic. For added comfort, opt for a wooden bar stool with an upholstered cushion. If you’re looking to use wood bar stools outside, choose denser woods like teak, eucalyptus, and acacia, which are the most weather- and insect-repellant woods. Metal: Bar stools made of metal typically have a sleek silhouette, making them especially suited to small spaces and those with more industrial or modern aesthetics. Keep in mind, metal barstools should always be used inside to prevent rusting. Rattan and/or Wicker: Rattan and wicker bar stools have a casual, timeless appeal that make them as suited to the kitchen as they are to the sunroom. They’re lightweight enough to move around, but keep them to covered spaces, unless they’re made of all-weather wicker. Previous Post:Want to Throw the Perfect Dinner Party For Your Family or Guests? 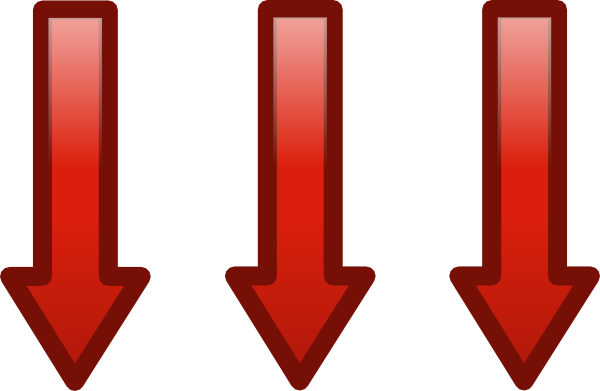 Find Out How to do Just That in This Useful Article!